From the pages of the Velvet Underground, put together in the ethereal style that is Stevie Nicks' - help us retrieve this special family memento created for Matthew Anderson in memory of his mother, Robin, (Stevie's best friend and fellow 'Gypsy'). 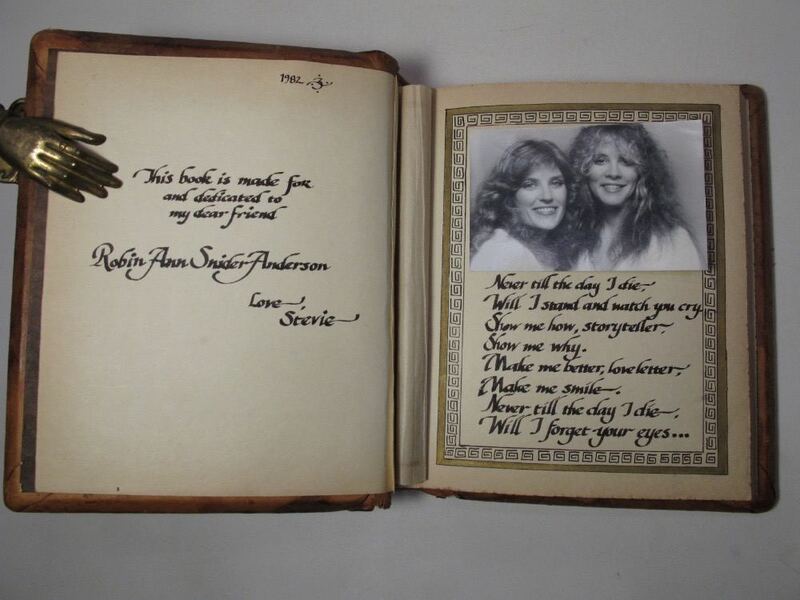 Devastated, in late 1982 Stevie commissioned a memorial journal to be made in Robin’s honor. It tells the story of Robin’s life and the friendship Stevie and Robin shared. Today, Robin’s son Matthew is 32 years old, and just a few weeks ago (in late May of 2015), Matthew and his wife Amanda gave birth to a beautiful, healthy baby girl named Robin Anderson in honor of her late grandmother. In a 1990 interview with US Magazine, Stevie mentioned the “beautiful book [she] wrote the year that [Robin] died” and the fact that she had intended for Matthew to be the recipient of the book and some other mementos from his mother. Unfortunately, the book was included in a large lot of items that eventually made their way to Herbert Worthington, the legendary Fleetwood Mac photographer known for the cover of “Rumours” and many of the band’s iconic images. When Herbert passed away in 2013, the book was auctioned off by his estate. That brings us to today. A collector purchased the book and, not knowing anything about Matthew, put it up for sale on eBay (along with a number of other items from Worthington’s estate). A few of Matthew’s friends have made contact with the seller, who has officially agreed to sell the book for the exact amount he paid for it: $9,250. The seller understands how important this book is to Matthew and has promised to reserve it for him while we raise the money to purchase it -- it was purchased with the intent of reselling for a profit, so for the seller to agree to sell it at his exact cost is a kind gesture on his part. Yes, this book is a legendary piece of rock and roll memorabilia, but it’s far more than that: it’s an eternal and heartfelt tribute intended for Matthew, a man who never got the opportunity to get to know his mom. With a growing family of his own, it’s also an opportunity for Matthew’s baby girl Robin to one day learn more about her grandmother. This campaign has been created by two of Matthew’s friends. Matthew did not ask us to do this, but we know how special this book is to him and we want him to have it more than anything in the world. Your donation will go directly to Matthew, and 100% of the first $10,000 raised will be used to purchase the book for Matthew ($9,250 for the book and $750 for GoFundMe associated fees). We will provide proof of purchase to all donors as soon as the book is purchased. 100% of all donations beyond the $10,000 goal will be donated directly to the City of Hope Robin Anderson Memorial Fund, which supports leukemia research and was created by Stevie herself in 1982 after Robin’s passing. As with the book, we will provide proof that 100% of all donations beyond $10,000 are donated to the fund.